LG Quantum in the House: And You Can Win One! Yesterday I posted about my complete lack of success in trying to buy a Samsung Focus from my local wireless carrier, Rogers Wireless. 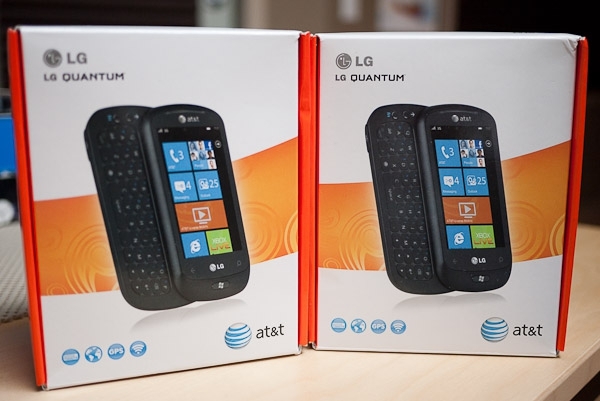 It seems mind-boggling that I can't buy one of these phones from my carrier yet, and it's frustrating to be running a Windows Phone site without access to a modern Windows Phone, but an unexpected source has come to my rescue: LG's PR firm in South Korea has sent me two LG Quantums! Talk about getting it directly from the source - awesome! I'll be posting an unboxing video early next week, but as you've noticed, there are two. And you know what that means: contest give away time! Stay tuned for details, but one lucky Windows Phone Thoughts reader will get one of these phones. Happy Thanksgiving to all of our readers from the USA! I'm jealous! Also a Rogers subscriber and frustrated with their lack of availability. I like the screen on the Focus, but the physical keyboard and additional LG apps (DLNA, augmented reality) make the Quantum's lack of Super AMOLED a worthwhile tradeoff. Looking forward to your review! Update -- ooopss, sorry, missed the AT&T logo on the bottom of the box. Should be good to go..! See how AT&T is stamped on the box? It's North American 3G. I wonder if we could score one of these babies on ebay???? Thanks for the (upcoming) opportunity to win one of these. I was wondering whether this phone would be worth it or not and am still curious. Thanks for remembering the US Thanksgiving holiday as well. Enjoying the time off work and spending time with friends/family. I look forward to the details of the giveaway whenever it comes. Thanks again for your work on this site. It's amazing how long you've been managing it now. an unexpected source has come to my rescue: LG's PR firm in South Korea has sent me two LG Quantums! Talk about getting it directly from the source - awesome! Well three cheers for them. I can think of another organization that should have taken care of that weeks ago. LOL....you'd think they would see the value wouldn't you? I'm surprised.